At the age of 84 in 1912, Dr. Thomas Addis Emmet had accomplished a great deal – but he wasn’t done yet. Born in 1828 in Charlottesville, Virginia, the son of a University of Virginia professor, Emmet became an esteemed gynecologist in the mid-19th Century. By 1855 he was assistant surgeon of the Woman’s Hospital on Ward’s Island and five years later was surgeon-in-chief. Emmet was internationally known in the field of women’s medicine, writing such books as The Principles and Practice of Gynaecology. In 1897 he received Notre Dame’s Laetere Medal, awarded to the Roman Catholic whose work was deemed the most beneficial to humanity and, in 1906, Pope Pius conferred upon him the title of Knight Commander of St. Gregory the Great making him one of the few Papal Counts in America. At 84 Dr. Thomas Addis Emmet could have taken a break. But he had other ideas. Commercial buildings had been gradually infiltrating Emmet’s residential neighborhood for a few years. He had lived at No. 89 Madison Avenue for over 40 years and had gradually acquired the three homes to the north – Nos. 91, 93 and 95 – as investments. Rather than retreat uptown like the rest of the wealthy, Dr. Emmet decided to rise above the commercial encroachment – literally. Emmet moved out of his old brownstone and commissioned Barney & Colt to erect a 16-story loft building on the site of the four houses. 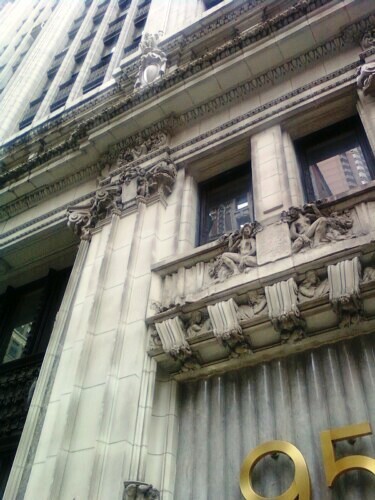 The ornate French Renaissance-style building was lavished with white neo-Gothic terra cotta ornamentation which managed to be at once stylish and whimsical. 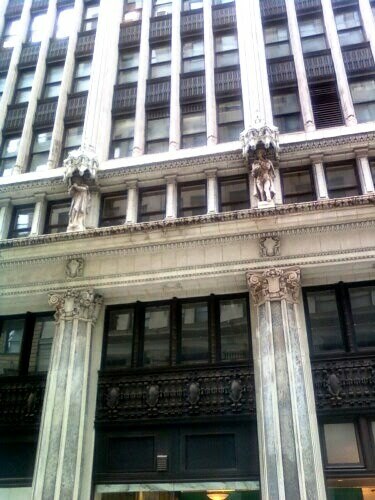 Four larger-than-life-sized carved limestone Medieval figures stand above the second floor cornice under ornate terra cotta canopies; two on the Madison Avenue side and two on the 29th Street façade. Legions of terra cotta gargoyles, more mischievous than frightening, decorate the façade with expressions of surprise or playfulness. It was the top floor, however, in which Dr. Emmet was most interested and that raised a few elite New York City eyebrows. In the days when the topmost floor of commercial buildings was reserved for housing the building superintendants or janitors, Emmet had a lavish apartment built on the 16th Floor. It included an 18 by 36 foot library, a solarium, and a roof garden with fountain, plants, marble seats and pergola. The doctor moved in with his 51-year old son, his nurse Margaret O’Reily and his cook, Koricki Myamiata. 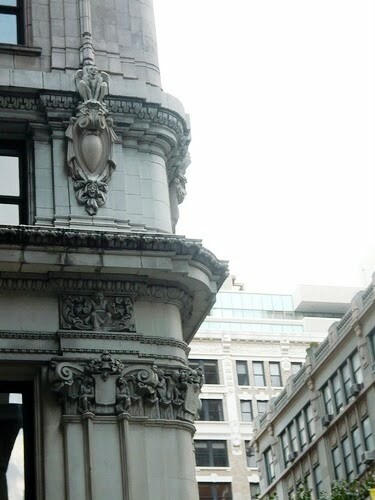 Among the first tenants were William Openhym & Sons, wholesale silk merchants and the Manhattan Shirt Company. The building boasted high speed elevators, a private elevator to Dr. Emmet’s apartment and fire-proof construction throughout. The architects carefully planned the roof level to conceal the water tanks, ventilating and boiler flues and other unsightly engineering necessities. 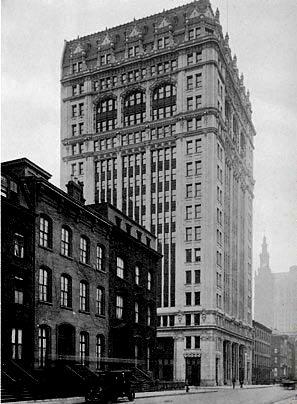 In keeping with the high tone of his building, Emmet had the lobby finished in Sienna and Numidia marble, mosaic floors, bronze elevator doors and surrounds and electric lighting “of special design.” The street level was a medley of limestone, cast iron ornamentation and green marble-clad pillars rising two stories. Following his death seven years later the doctor’s apartment was converted to office space. The exterior, however, has remained astonishingly unchanged. In 1991 the entire façade was inspected and restored by Walter B. Melvin, Architects, LLC. Because of the poor condition of the 15th floor cornice, which the firm described as “particularly graceful in its detailing,” significant replacement and restoration was necessary. Fabrication of several hundred terra cotta elements was executed – some as large as 42” by 42” by 18” – bringing the Emmet Building back to its original condition.